The Consumerization of B2B Sales in Industrial Manufacturing – True Omni-Channel Sales the New Norm! The future of B2B sales in industrial manufacturing industries is driven by simplification – the digitalization of the sales process is an imperative! B2B sales in industrial manufacturing is significantly changing: from a traditional sales cycle, which is based on time-consuming sales rep interactions to a streamlined, convenient sales process with a consumer-grade customer experience and global reach. In this approach, web channels play a major role and cover certain process steps with a true omni-channel customer experience. They are emerging as one-stop-shops – providing information and self-services to simplify the buying of original equipment, spare parts, services, and solution bundles. This change is driven by the customers of industrial machinery and component (IM&C) companies as well as from the manufacturing companies themselves, to drive profitable growth, enter new markets, and attract new prospects. 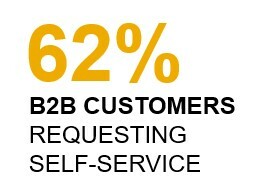 “65% of B2B customers say their B2B experiences does not match their consumer experiences on Amazon.com and similar sites.” Source: EY How will you change buyers into stakeholders? As per different surveys, customers of IM&C companies are not happy with their buying experience. 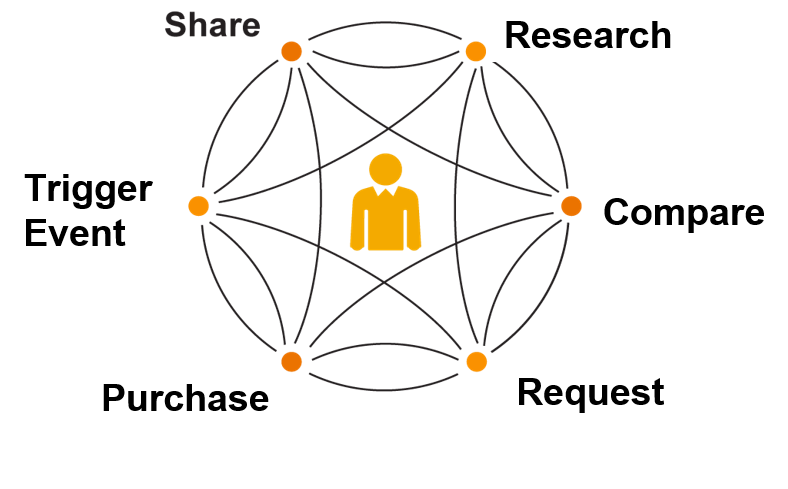 Procurement managers and others expect that doing business with their vendors to be easier and require less time-consuming meetings with sales reps (the orange process steps in the picture below), but still easily acquiring all the valuable information about the company as well as the products and services it offers in a convenient way through web channels (the gray process steps) – with all the associated comfort of a state-of-the-art B2C buying experience. This is expected to be the new norm for B2B sales in industrial manufacturing. Especially during the sales of complex products, the interaction with sales reps will continue to be highly important, but certain process steps can be more easily covered through a web channel solution. For productive and professional customer engagements, sales and marketing professionals need a deep understanding of their customers and their customers’ buying journey. The detection of buying signals and a contextual marketing approach to identify new prospects is getting significantly more important in industrial manufacturing and will be described in one of my future blogs. Achieving a consumer-grade customer experience for B2B sales requires that IM&C companies provide access to all valuable information and self-services through their web channel and enable a convenient buying of spare and emergency parts; configurable products and equipment; software and services; as well as product bundles through a one-stop-shop solution – covering the entire product portfolio. All customers can conveniently access the web channel whenever they want to get all information they need in an easy-to-understand way through nice 3D visualizations and exploded views. Customers can also initiate an interaction with a sales rep when they want a more in depth discussion. The sales professional can get a deep understanding of the customer through his buying journey and can prepare a very professional customer interaction. After the physical meeting(s), the customer can finalize the buying journey and close the transaction through the web channel solution. For a true omni-channel experience, customers and sales professionals have access to all valuable information as well as a harmonized configuration, price, and quotation process. To cover certain process steps through digital channels, the digitalization of the sales process is required. As the above picture shows, this differentiating customer experience with a global reach could not be achieved with “siloed” solutions across the different customer interaction channels (a typical multi-channel approach). 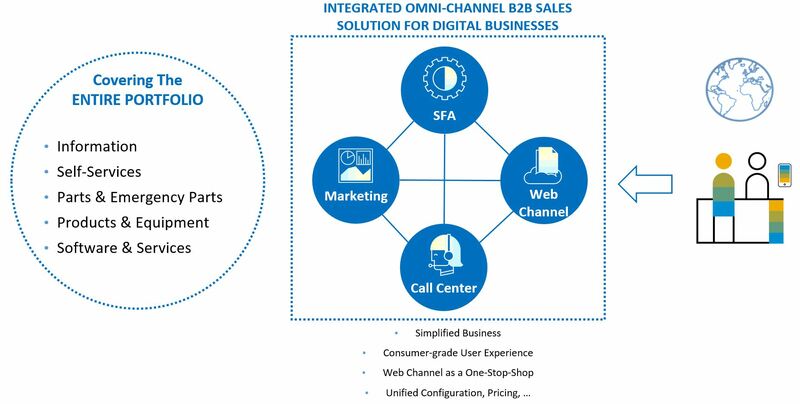 The experience requires an integrated omni-channel B2B sales solution for digital businesses, spanning the web channel solution, the sales reps’ sales force automation solution, the call center solution, and a seamless embedded marketing solution. All industrial companies who plan to move to a true omni-channel sales approach using a web channels as a one-stop-shop playing a major role in the B2B sales process need to consider that configuration, price, and quote capabilities will get much more important for front line sales reps in the future. Please read my blog “Configuration for Front-Line Sales Reps …” for more details on this important change and the difference of multi vs. omni-channel. For more information on digital channels for B2B sales in manufacturing please read my other blog “Digital Transformation & Customer Centricity for Industrial Manufacturing”. Our market-leading web channel solution for B2B and B2C sales (SAP Hybris Commerce Cloud) is a core part of this solution. For more information check out the SAP Solution Explorer. I am very interested in other thoughts on the consumerization of B2B sales in industrial manufacturing industries and best practices on how to move to a true omni-channels sales approach for a superior customer experience. Dietmar Bohn is a Vice President of Industry Solutions Management at SAP SE, focusing on customer centricity and digital transformation. He brings more than 15 years of CRM experience from both outside and inside SAP and more than 25 years of industry experience. Dietmar has held various executive roles spanning CRM strategy projects, CRM implementation projects, CRM development and CRM product management. Before joining SAP, Dietmar has held different management positions in R&D, IT and Global Sales & Marketing organizations at Heidelberger Druckmaschinen AG. Dietmar holds degrees in Electrical Engineering and in Telecommunications. Thank you, John. 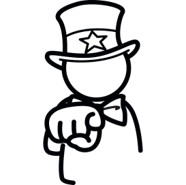 Just read your article on digital marketing: really like that you stress the marketing/sales collaboration which is still a challenge for many B2B businesses.